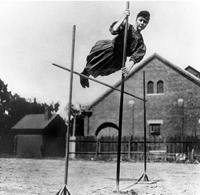 Ina Gittings, University of Nebraska in 1906, is shown in the earliest photograph of a woman vaulting. She was an early women’s educator, a community activist and a homesteader in Oro Valley. A major local roadway is named after her. Out how do you pronounce her name? Ina Gittings. You say EE-riah and I say EYE-nah? More on that later. Ina sittings was born in 1885 in little Wilbur, Nebraska. Ina was a professional woman ahead of her time. She earned a university degree and led a successful, independent life. She never married. Gittings graduated from the University of Nebraska in 1906. Her first job was OS a public school teacher in Lead, South Dakota. Ina served as a physical education instructor at the University of Nebraska from 1906-1909 and then spent six years as the director of women’s physical education at the University of Montana. She was a trailblazer in women’s athletics! When America entered World War I in 1917, Ina Gittings left education and volunteered to go to France and serve as a physiotherapist, She helped the wounded young men to recover, After the war, she also served in relief efforts in Turkey. Before the 1970s, universities provided very little in funds or facilities for women’s athletics_ Men’s sports received the vast majority of athletic funds. ‘We struggled to get everything they [the girls] wanted to keep them interested. It was quite a battle sometimes, but we succeeded,” she later remembered. 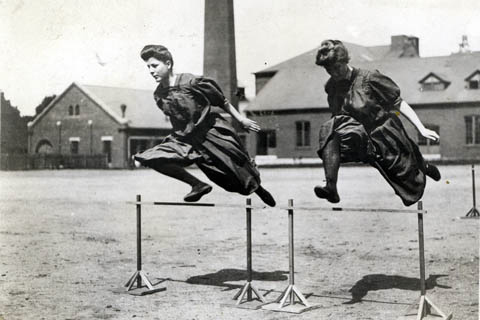 At one point, the women needed an extra athletic field for newly introduced sports. Only the Department of Agriculture’s onion fields were available. Ina won the battle and obtained the onion fields, but she and the female athletes first had to harvest the onions themselves. Miss Gittings was very active in the Tucson community and in professional organizations. She served as the president of the National Women’s Overseas Service League of World war I. Ina was a member of the Tucson YWCA board and a charter member of the Alpha Phi sorority_ She often delivered talks on physical education and health to local organizations. Ina Gittings was also one of Oro Valley’s early pioneers, She claimed two sections of federal land under the Homestead Acts in October, 1932. The sections totaled 480 acres. One parcel of 160 acres was located in what is now Rancho Vistoso, along Rancho Vistoso Boulevard and includes most of the Vistoso Vista subdivision. The other parcel, along what is now Ina Road, totaled 320 acres. This was located east of La Cholla Boulevard, between Magee Road and Ina Road. Homesteaders were required to build a residence to keep title to the land but did not have to live there full time. Miss Gittings had a home near the university and probably visited the homestead on weekends, as many Tucsonans did. Professor Gittings stepped down from the position of Director of Women’s Physical Education in 1951. She kept her professorship and some teaching duties until fully retiring in 1S55. Richard Harvill, president of the University in the 196.0s, said “Miss Gittings served the University with complete dedication and competence for 35 years” and her influence on young women was well known and widely recognized.” She continued to deliver talks to community groups into the 1960s. Ina Gittings died in 1966. The Gittings Memorial Fund was established in her honor. She is listed on the Women’s Plaza of Honor on the University of Arizona campus and Gittings Hall was s built in 1964 and named for her.When you drive on Ina Road, remember women’s educational pioneer and Oro Valley homesteader Ina (EE-nah) Gittings.